What an incredible race day. Race results are in! Click here. 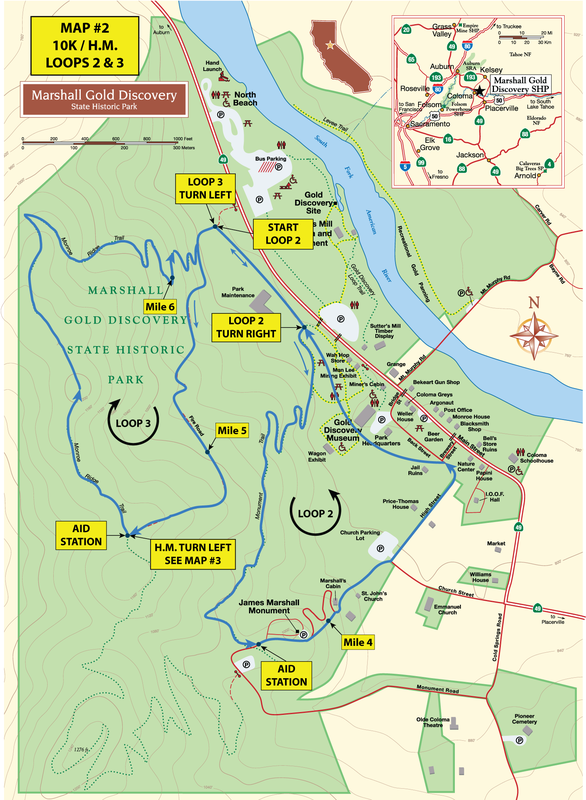 This event is run entirely inside the Marshall Gold Discovery State Historic Park, set in the beautiful foothills of Coloma along the south fork of the American River. This is the site at which gold was discovered in 1848, igniting the gold rush and leading to California’s quick rise to statehood. All of the courses are a mix of very appealing singletrack dirt trails and a few paved areas. The are some moderately technical ascents and descents with a lot of switchbacks. There are also some sections of rolling hills and other places where the course is completely flat. With the addition of scenic views and a variety of wildlife, there is plenty to make this run very enjoyable and interesting. The race is held rain or shine. Be aware that it can be very cold in Coloma in the morning. No strollers are allowed in the race. The time limit for this event is 4 hours. Active military receive a 15% discount. Entry fees are non-refundable unless the event is cancelled. Pre-registered runners may purchase a T-shirt for an additional $20.00 if they register two weeks ahead. ONLINE Online registration is available through the morning of the race. Print a PDF form and mail to us. Race day registration is available beginning at 7:30 AM. Please add $10.00 to the above fees. NOW Volunteers are needed to help with aid stations. Everyone who helps out gets a free future race! Runners participating in all four races first follow the 5K course and return to the start/finish location. The 5K course makes a large clockwise loop around most of the park, climbing to the highest point (about 500 feet above the flat meadows) and following the Monroe Ridge Trail past scenic views before descending to the base of the mountain where runners reach the finish line. The 10K, 15K, and half marathon courses continue by following a shorter counterclockwise loop that makes a gradual ascent along the Monument Trail and returns to the starting line in the opposite direction. Runners then head straight up the mountain on the steep half-mile fire road before the 10K/15K and half marathon courses split. 10K and 15K runners turn right and follow the Monroe Ridge Trail clockwise back to the finish line at the base of the mountain just as they did for the first loop. 15K runners then follow the 5K loop again. At the top of the fire road, the half marathon course turns left and follows the Monroe Ridge Trail in the counterclockwise direction. Runners descend along the Monument Trail, where they pass the halfway mark, and return to the start/finish location. The remainder of the half marathon course consists of two counterclockwise loops following the entire Monroe Ridge Trail and descending along the Monument Trail a second and third time before crossing the finish line. The course is well-marked with signs at every intersection and chalk lines on the ground in important locations. Mile marker signs are posted for all distances, and a halfway sign is posted for the half marathon. The elevation profiles for the 5K, 10K, and half marathon are shown below. The 15K course follows the 10K course and then repeats the 5K course. There are two well-stocked aid stations on the course, and they are shown on the maps above. One aid station is located at the James Marshall monument, and the other is located where the fire road meets the Monroe Ridge Trail. For 10K and half marathon runners, aid is also available at the finish line as you pass by to begin a new loop. Plenty of refreshments are available at the finish line for all runners. 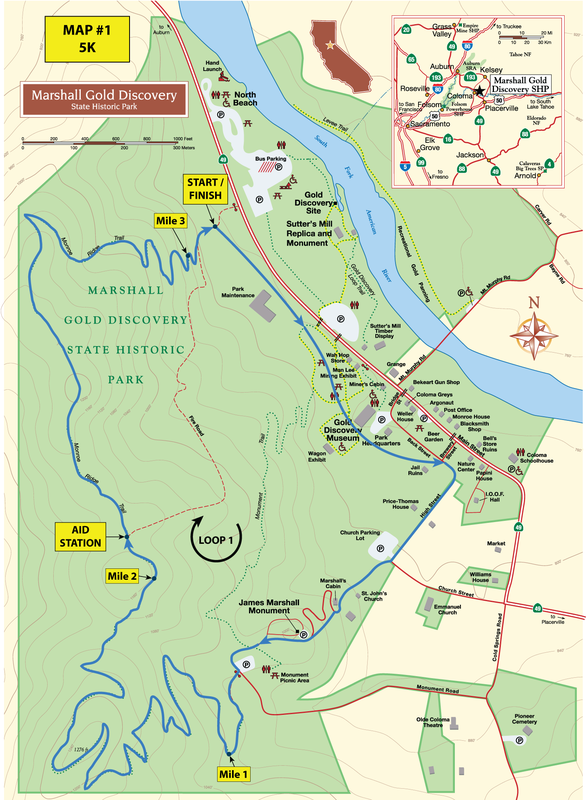 Marshall Gold Discovery State Historic Park is located on Highway 49 in Coloma, between Auburn and Placerville. It’s in a rather remote area, so be sure to give yourself plenty of time to drive out on the morning of the race. Please park in the North Beach parking lot located at the north end of the park. Note there is an $8.00 parking fee per vehicle. Golden Poppy passes are accepted. Race registration and check-in is located next to the start and finish lines in the Monroe Orchard, right across Highway 49 from the North Beach parking lot. All runners in the 5K, 10K, 15K, and half marathon receive a medal for finishing the race. 2019 race results are in! Click here. Kirkwood. Ultra. You! Are you ready for the ultimate high country trail running challenge? Check out Troy's Summer in the Sierras series at TCTRuns.com. You will be blow away by these trails! Thank you, runners, for joining TCT Runs for a beautiful day in the hills of San Jose!